Purblind Pillar is a new route on the Angel Food Wall, just to the right of Group Therapy (5.7). As the name suggests, the first ascentionists where surprised that such a quality route could remain undiscovered for so long. This is a great line with short cruxy sections and every pitch is good. It is also a worthy alternative when Tunnel Vision (5.7) or Group Therapy are busy. A great way to enjoy Purblind Pillar on a hot day is to carry your lunch up with you, and enjoy it along with the views in the oasis of pine trees on top. Our GearLooptopo for Purblind Pillar contains all the information you need for the climb, starting from the White Rock Springs parking. This parking is located about halway along the Scenic Drive. There are no direct combinations possible. 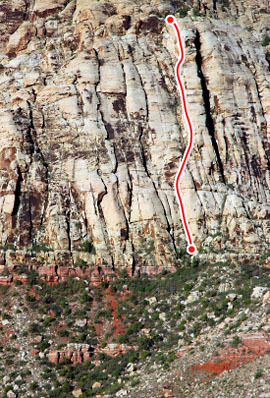 If you want to climb another route on Angel Food Wall, you have to walk off and return to the wall. This takes about 30-45 minutes. You can climb the popular Tunnel Vision (5.7), which probably has no lines in the afternoon. Another great route with lots of wide cracks is Group Therapy (5.7) which starts only a few yards left of Purblind Pillar. Don't forget your big gear. If you have climbed these suggested climbs already, you might want to try Stilgar's Wild Ride (5.8), which is a spicy route for the grade and has some interesting chimney climbing. Tunnel Vision (5.7), Group Therapy (5.7), and Stilgar's Wild Ride 5.8 are the most popular climbs on Angel Food Wall and are all a little similar to Purblind Pillar. For other varied climbs at a similar grade and length, you can try Olive Oil (5.7) or Frogland (5.8). Both are much more popular than Purblind Pillar, so don't be surprised to find a line to get on those climbs. If you are looking for varied climbing at a higher grade and a bit longer, you should definitively go for Black Orpheus (5.9+) or Frigid Air Buttress (5.9+). The classic Black Orpheus has an alpine feeling to it, and has a long and complicated, but enjoyable, descent. Frigid Air Buttress sees less traffic and has big belay ledges at almost every belay. It really deserves to be climbed more often. Download the Purblind Pillar PDF file or visit the PDF Center.